The head traumas described in the Edwin Smith Papyrus among other medical states represent a proof of neuroscience interest already 1500 years before JC . However, even with years of study, much remains unknown about the CNS (central nervous system)—as asserted by Pamies & al. —much more than for other organs because of the brain specific cellular organization. The number of neurodevelopmental diseases increases greatly. As an example, the prevalence of Autism Spectrum Disorders went from 6.8 per 1000 children in 2000 to 14.6 in 2012 . Due to the ageing population, the number of neurodegenerative diseases such as Alzheimer’s disease (AD) or Parkinson’s disease is also expanding. According to the WHO (World Health Organization), nearly one billion people in the world have a neurological disorder including epilepsy, Alzheimer’s disease, CVA (cerebrovascular accident), neuroinfections, etc… . There is an increasing need of an in vitro model to assess the neurotoxicity of therapeutic drugs on the brain and to study neurological diseases by analyzing the functionalities and interactions of brain regions. In fact, in vivo models with mouse or rat brains have been widely used but are limited. Marshall et Rowel  observed that animal testing methods are not enough to correctly predict drug efficacy and pick out the advantages of alternative methods. Moreover, the neuronal plasticity, which is one of the main reasons of the brain complexity, is difficult to reproduce with existing traditional in vitro models. Pamies & al. claimed that microphysiological systems offer the possibility of a three-dimensional (3D) simulation of the brain physiology and functionalities. An efficient brain-on-chip could help develop the global understanding of the CNS by modeling a small part of the brain like the Blood Brain Barrier (BBB) as done by Griep & al in 2013 . Dauth et al (2017) for their part modeled the interactions between different brain regions . These microchip devices could also be used to test the potential neurotoxicity of new drugs and to study the biochemical mechanisms underlying neurological disorders. A 3D model of complex neural networks with cultured neurospheroids—used to simulate Alzheimer’s disease—will be described later on in this review as an example of a brain-on-chip application. More remarkably, the iPSCs (induced Pluripotent Stem Cells) technology combined with a brain-on-chip can allow the use of personalized medicine in the neuroscience field. Figure 1: Schematic representation of synapses, showing the inside of a neuron and a myelinated axon. Another key point for brain modeling is the Blood Brain Barrier (BBB) which is extremely important to assess brain toxicity. This biochemical membrane structure is specific to the brain. 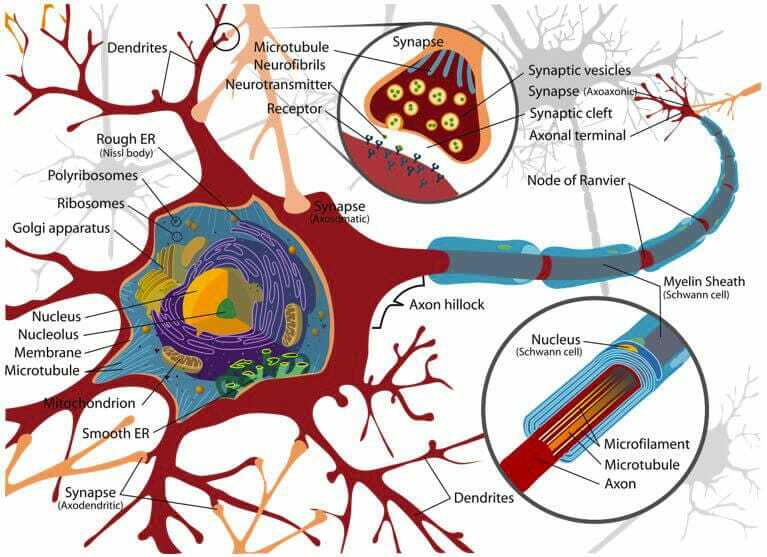 It consists of endothelial cells, with tight junctions, that separate blood and extracellular fluid of the CNS. Pamies & al. precise that neurons are mostly closer than 8-20 μm from a vascular capillary. Small molecules like water, O2, CO2, hormones can passively enter the brain and other essential molecules like glucose or amino acids can go through the barrier by active transport. According to the researchers , the brain blood flow plays a role in brain development and function. Malfunctions of the BBB can partially cause neurodegenerative disorders , . The semi-permeability of the endothelial barrier is needed to maintain the brain homeostasis without allowing the entrance of neurotoxic molecules, however, many therapeutic drugs are also blocked. A reliable model of the interface between blood and brain interstitial fluid seems useful to study these neurological disorders and evaluate drugs crossing and effects. In vitro models are interesting for large-scale study at low costs but very few are dynamic. Griep & al. demonstrate the potentiality of a 3D-microfluidic model of the BBB based on human cells to include blood flow movement by adding shear stress. This BBB chip only lasts seven days but shows potential for the development of neurologic diseases models. Park & al modeled the brain environment on a microfluidic brain-on-chip with a simulated interstitial fluid flow . They used their microchip to model neurodegeneration induced by amyloid-beta in Alzheimer’s disease (AD). In order to give a better overview of the brain-on-chip technology and its potential applications, this model will be described in more details. This section and the following will present the more recently developed brain-on-chip used for the Alzheimer studies, implemented by Park, J. and al. . The aim was to develop a device that more closely mimicked the brain environment observed in vivo, with a corresponding 3D cytoarchitecture. Thus, they based their chip on three-dimensional neurospheroids subjected to a constant flow of fluid as observed in the interstitial space of the brain. In order to form homogeneous neurospheroids with a uniform size, they used a chip with concave microwells. 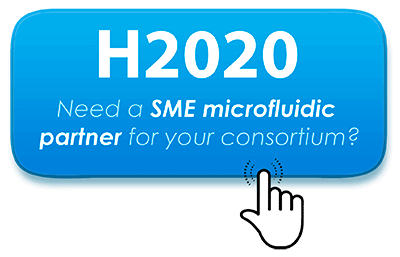 The continuous flow of medium was provided with the help of an osmotic micropump system developed by Park et al. ; which was connected to the outlet. The chip, composed of a top chamber and a bottom layer with 50 cylindrical wells, was fabricated using polydimethylsiloxane (PDMS). The neurons were primary cortical neurons that were isolated from cerebral cortical regions of rat embryos. After building a microfluidic chip modeling a normal brain, Park & al. adapted their brain-on-chip to simulate an AD brain. Figure 2: From Park, J., Lee, B. K., Jeong, G. S., Hyun, J. K., Lee, C. J., & Lee, S. H. (2015). Schematic diagram of the brain-on-chip device. The device is connected to an osmotic micropump which provides an interstitial flow. The chip is based on 3D neurospheroids. Amyloid-β was added to model Alzheimer’s disease. Amyloid-β is a peptide, found to be involved in Alzheimer’s disease as the main component found in the amyloid plaques in the brains of patients. In order to correctly investigate Alzheimer’s disease, they formed four groups, with different culture conditions: the first one corresponded to a control group, with neurospheroids without flow, the second one corresponded to the same conditions but with an addition of amyloid-β, and finally the third and fourth groups were neurospheroids cultures with flow, without and with added amyloid-β, respectively. Depending on their group, cells were cultured in a “normal” neurobasal medium (Gibco) for 10 days or 7 days followed by 3 days in a medium containing amyloid-β. Figure 3: From Park, J., Lee, B. K., Jeong, G. S., Hyun, J. K., Lee, C. J., & Lee, S. H. (2015). 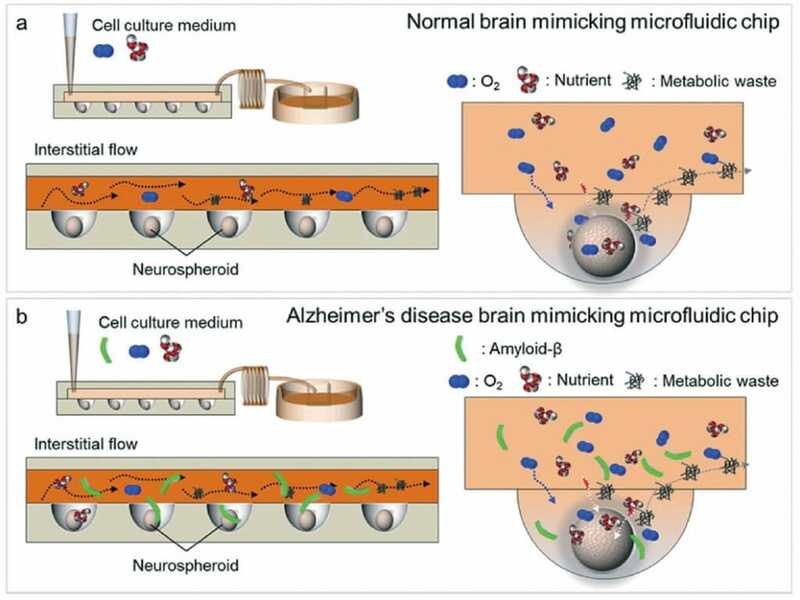 Schematic representation of both a microfluidic chip mimicking a normal brain (a) and a microfluidic chip mimicking a brain with Alzheimer’s disease (b). (a) In normal conditions, the neurospheroids were cultured for 10 days with oxygen and nutrients. (b) In Alzheimer’s disease conditions, cells were cultured for only 7 days with oxygen and nutrients and then with a medium containing amyloid-β for 3 days. To determine the different consequences of the addition of continuous flow of nutrients, cytokines and oxygen to the cells, they compared the static with the non-static group. The first obvious difference was the global size. At day 0, the neurospheroids in both groups were the same size on average. 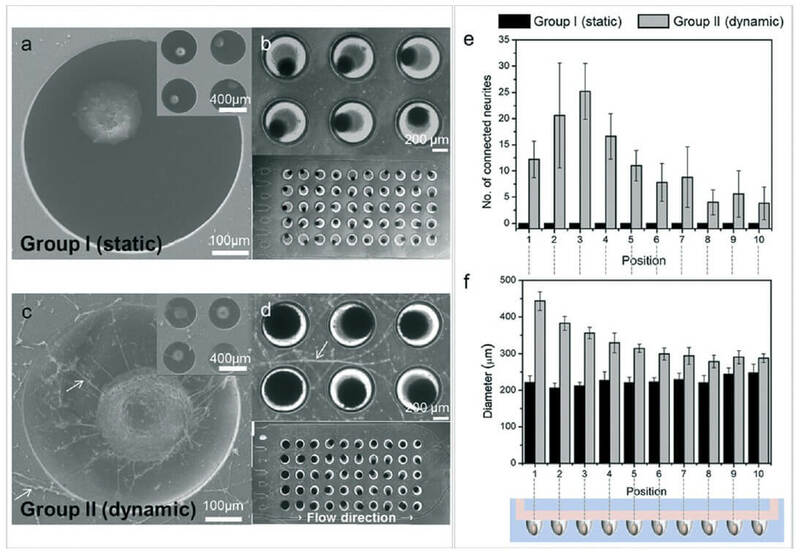 After ten days, they did the same measurements and found that the neurospheroids cultured with a continuous flow increased (with a pattern: cells became smaller toward the outlet), whereas the other ones remained unchanged. A second difference between the two groups that seemed to directly result from the interstitial flow was the pattern of network formation on the chip. In fact, the group subject to a flow revealed greater neurite extension in neurospheroids, which directly imply a more robust neural network formation. This was confirmed by the immunostaining of synapsin IIa, a protein belonging to the synapsins, a family of proteins implicated in the release of neurotransmitters at synapses. The intensity of this synaptic marker was a lot higher in the dynamic model, meaning that the continuous flow also enhances synapse formation. Indeed, the use of two other markers: B-III tubulin as neuronal marker and nestin as neural stem cell marker, suggested that under continuous flow, the differentiation of neural progenitors cells into neurons was promoted. Parks & al noticed that the interstitial flow is needed to bring nutrients, cytokines and oxygen to the cells and therefore participate to the formation of the synaptic network. Figure 4: From Park, J., Lee, B. K., Jeong, G. S., Hyun, J. K., Lee, C. J., & Lee, S. H. (2015). Neural network formation in static and dynamic groups. (a and c) SEM images of neural network formation with neurites indicated in white. (b and d) Optical images of neural network formation with neurites indicated in white. (e and f) Analysis of neural network formation by measuring the average number of neurites and the average size of neurosperoid from each microwells section. The adding of amyloid-B in half of the cultures allowed them to study how these proteins affected the neurospheroids. They used thioflavin S to stain the neurospheroids and study the presence and distribution of amyloid-B. First of all, they observed that the amount of amyloid-B remaining in the neurospheroids was greater in the dynamic flow model. After quantifying the dead cells, they showed, as expected, that the cultures with amyloid-B presented less viable cells, which corresponded to the neurotoxic and apoptotic effects of this protein . They reported lower levels of synapsin, tubulin and nestin, which also correlates with a destruction of the neural networks. With the comparison of the different culture groups made by Parks & al. , some useful information came out. First of all, the 3D cytoarchitecture that was put in place provided good results concerning the reproduction of the brain microenvironment. The consequences of the addition of an interstitial fluid flow contributed to the potential of this brain-on-chip as a drug-screening and cytotoxicity testing tool, as it helped achieve a more robust neuronal formation, with accelerated differentiation of neural progenitor cells into mature neurons. This was probably due to the continuous supply of nutrients and fresh medium rich in oxygen, as well as the elimination by the flow of the metabolic wastes. Concerning the amyloid-B tests, the different observations enable Park & al. to confirm the neurotoxic and apoptotic effects of the protein, which could further induce synaptic dysfunction. As this protein is supposed to cause Alzheimer’s disease, the effects of amyloid-B on the 3D microculture open the possibilities for fast and low cost neurodegenerative models. Under static conditions Park & al observed more pronounced effects of amyloid-B, consistently with access to the neurospheroids only by simple diffusion compared to diffusion under flow conditions. However, you would expect removal of amyloid-B under interstitial flow. This was not the case in the study of interest because there was a constant supply of amyloid-B without fresh medium supply. Re-circulation is a common issue in organ-on-chip technology especially when several organs are combined to create a multi-organs chip, also called human-on-chip. For toxicity testing and pharmacological studies, it is important but mixing different cellular cultures while allowing interactions, is very challenging. Indeed, toxicity is not accommodating enough to be limited to only one organ, it mostly acts through multi-organs pathways, as noticed by Rogal et al. . For a 3D culture of the brain associated with other organs, the BBB, whose model by Park & al. was described before, is the key point. Nevertheless, the BBB-on-chip model would be better if adapted to human neuron cells. The iPSCs cells have amazing potentiality to produce human neurons but, as explained by Dauth & al. , cannot yet make differentiation specific to a brain region. These differences of neurons properties (cell composition, protein expression metabolism, etc) across brain regions need to be investigated in the next version of the device. R. P. Feldman and J. T. Goodrich, “The Edwin Smith Surgical Papyrus,” Childs Nerv. Syst., vol. 15, no. 6–7, pp. 281–284, Jul. 1999. D. Pamies, T. Hartung, and H. T. Hogberg, “Biological and medical applications of a brain-on-a-chip,” Exp. Biol. Med. Maywood NJ, vol. 239, no. 9, pp. 1096–1107, Sep. 2014. “Facts About ASDs,” CDC—Facts about Autism Spectrum Disorders—NCBDDD. [Online]. Available: http://www.cdc.gov/ncbddd/autism/facts.html. [Accessed: 31-Aug-2017]. World Health Organization, Ed., Neurological disorders: public health challenges. Geneva: World Health Organization, 2006. L. J. Marshall and A. N. Rowan, “Advances in alternative non-animal testing methods represent a way to find new treatments for patients,” Eur. J. Intern. Med., May 2017. L. M. Griep et al., “BBB ON CHIP: microfluidic platform to mechanically and biochemically modulate blood-brain barrier function,” Biomed. Microdevices, vol. 15, no. 1, pp. 145–150, Feb. 2013. S. Dauth et al., “Neurons derived from different brain regions are inherently different in vitro: a novel multiregional brain-on-a-chip,” J. Neurophysiol., vol. 117, no. 3, pp. 1320–1341, Mar. 2017. J. 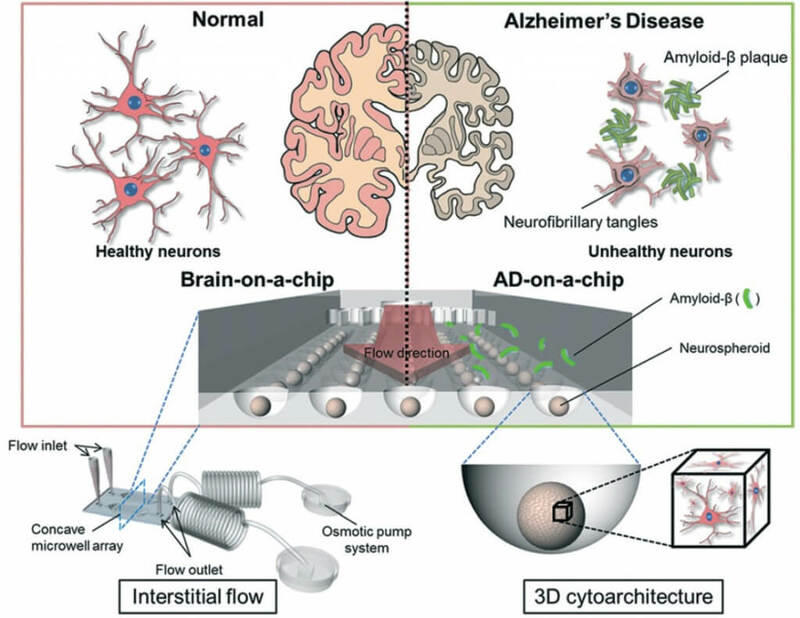 Park, B. K. Lee, G. S. Jeong, J. K. Hyun, C. J. Lee, and S.-H. Lee, “Three-dimensional brain-on-a-chip with an interstitial level of flow and its application as an in vitro model of Alzheimer’s disease,” Lab Chip, vol. 15, no. 1, pp. 141–150, 2015. Y. J. Choi, J. Park, and S.-H. Lee, “Size-controllable networked neurospheres as a 3D neuronal tissue model for Alzheimer’s disease studies,” Biomaterials, vol. 34, no. 12, pp. 2938–2946, Apr. 2013. D. T. Loo, A. Copani, C. J. Pike, E. R. Whittemore, A. J. Walencewicz, and C. W. Cotman, “Apoptosis is induced by beta-amyloid in cultured central nervous system neurons.,” Proc. Natl. Acad. Sci. U. S. A., vol. 90, no. 17, pp. 7951–7955, Sep. 1993. J. Rogal, C. Probst, and P. Loskill, “Integration concepts for multi-organ chips: how to maintain flexibility? !,” Future Sci. OA, vol. 3, no. 2, Mar. 2017. Written by Emilie Grandfils and Marjorie Metzger, corrected by Julie Cavallasca, under the supervision of Dr. Guilhem Velve Casquillas.